Boronia ‘Seaside Stars’ flowers heavily from late winter through to late spring. The flowers cover the bush which grows to 1m in height with a spread of 50cm. The flowers are fragrant and last well in floral arrangements. In native gardens and indeed in any sunny gardens the plants stand out when in flower. Boronia safrolifera has been in cultivation for many years, it is a desirable garden plant. ‘Seaside Stars’ was selected for its massed flowering displays which occurred over 8-10 weeks at the end of the winter period. In native fields of B. safrolifera growing near Bribie Island which were destined for clearing for housing development two plants stood out from the many thousands in the field. In cultivation they have continued to perform well. One needs to make sure that conditions are right for the health of the plant. Boronias in nature are usually found in moist, protected areas sometimes with light shade. Like many Boronia ‘Seaside Stars’ can be difficult to maintain for long periods in cultivation if conditions do not suit. All Boronias require a well drained moist soil and should never dry out . Plant on a mound for drainage, work the ground and add some good garden compost before planting. Mulching should be sparse but some is beneficial. After flowering light pruning will encourage new growth and make the bush more compact. 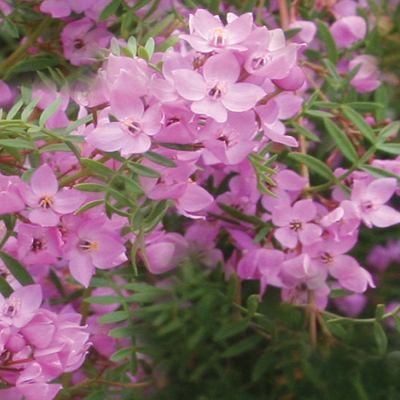 Boronia are well known Australian native plants. They are found through much of the Australian bush land. Boronia safrolifera from which Boronia ‘Seaside Stars’ is derived is found in coastal areas from Port Stephens in New South Wales to Bribie Island in Queensland. Land they grow on is usually called wallum. Winter and spring flowering by nature they brighten the bush with their abundance of flower which occurs over several months. Boronia ‘Seaside Stars’ is from the progeny of the Bribie Island area. Boronia safrolifera is named for the volatile oil, safrol which is contained in the leaves.